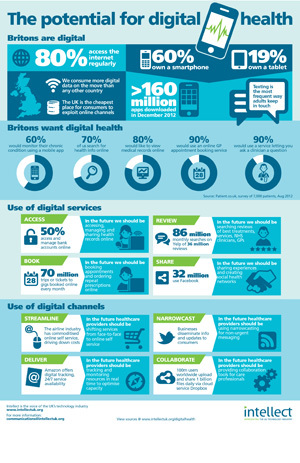 Britons are big users of the internet and want to use a range of digital health services. Other industries have embraced the opportunities of digital services and channels – so what’s the potential for health? That, in a nutshell, is what our latest infographic for trade group Intellect, the voice of the UK’s technology industry, is all about. Intellect commissioned a shortform infographic that complemented their brand guidelines. It explains in a clear and direct manner what we could be doing in the future, and what healthcare providers could be providing. You can see the full infographic here on Intellect’s website.